St John’s Wort – restorative tonic for the nervous system and an analgesic. Chamomile – an anti-inflammatory, anti-spasmodic sedative. The burning action of the candles works like a chimney, infusing the herbs and essential oils into a vapour, which is drawn into the auditory canal. This performs a massaging function, gently stimulating secretion flow as well as softening any impurities. This process also equalises the pressure in the head and ears, making them a particularly suitable treatment prior to flying or swimming/diving. Deeply relaxing, calming and soothing. You remain fully dressed for this treatment. I will ask you a few questions about why you have chosen this treatment and complete a medical questionnaire with you to ensure this treatment is appropriate and to ensure you haven’t got a condition for which this treatment may not be suitable at the moment. As part of the treatment I will do a facial draining massage, so it’s preferable that I remove any make-up before the treatment. You will lie on your side and I will ensure you are warm and comfortable and your shoulders are protected from any small particles of ash with a towel. If one ear is more ‘troublesome’, I work on the ‘good’ ear first. I will gently place the candle vertically in your ear and check its position for your comfort and correct treatment. I will light the end of the candle and hold it steady while it burns down to a soft ash. You will feel gentle heat and hear a pleasant crackling/rustling noise as it burns. During this time you can relax and enjoy the sensation. After about 10 minutes, the candle will have burnt to the prescribed length and I will gently remove it and extinguish it. I will do a short draining massage to that side of your face. Then you will turn over to your other side and I will repeat the treatment to the other ear. When both ears have been treated, you will turn onto your back and I will complement the candle treatment with a full facial and head massage which will continue the draining process and promotes further relaxation. The whole treatment will take about 45 minutes after which you should lie still for a few minutes before sitting up and having a drink of water. Whilst some people like to examine the residue in the candle tip I feel this only indicates the way the candle burnt in each ear and might confirm that one ear is more blocked than the other. I believe it’s really more important to consider ‘what has gone in rather than what is left behind!’ The effect of the treatment will continue for 2 or 3 days during which time you may notice you need to blow your nose more frequently or impurities work their way out of your ear. Anyone of any age – providing they can lie still for 10-12 minutes at a time! People who fly on holiday or for work, swimmers, parachutists and divers have all gained particular benefit from the pressure regulating capacity of the treatment. Initially, it is advisable to repeat the treatment within 7 days, then a fortnight later and subsequently as often as needed or preferred as a preventative course of treatment and maintaining well-being. 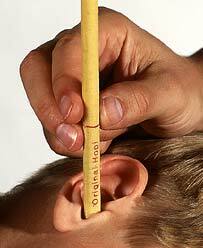 In addition, I offer the use of Otosan ear drops, a gentle natural product which helps maintain a healthy ear canal.